To successfully transfer all your contacts, ensure you've backed up your old phone via Backup Assistant or Cloud before activating your new phone. If your old basic phone isn't working, any contacts that you've backed up can be restored to your new phone. From the main screen of your old basic phone, select Menu. For devices using Backup Assistant, press the right soft key ('Backup Now'). Once the backup process is complete on the old phone, turn it off to ensure that it doesn't interfere with restoring data to your new phone. If necessary, activate your new phone. Once activation is complete, you're ready to transfer your contacts. 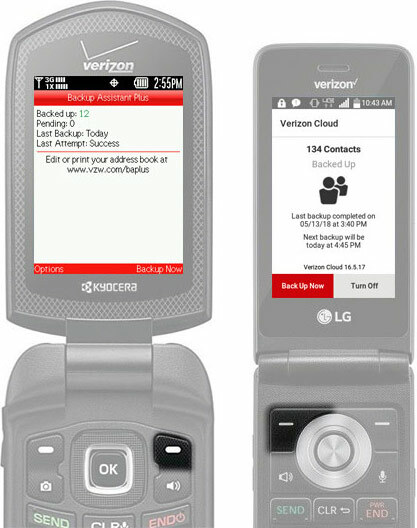 From the main screen of the new basic phone, select Menu. Utilize the 5-way navigation pad to highlight and center/OK button to select. If prompted to enter a PIN, you can view your PIN on the My Verizon website. It may take several minutes to download all your contacts to the new phone. When the phone displays "Backed Up", check the number of contacts.